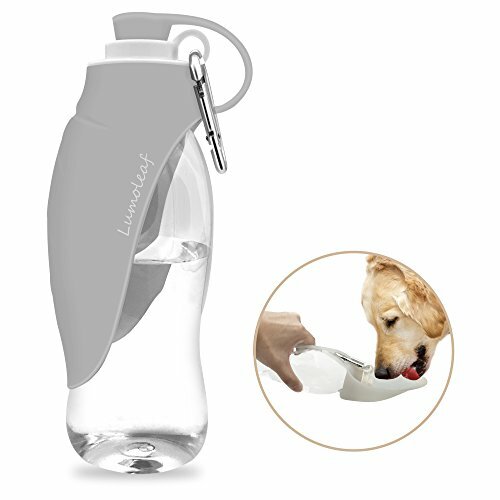 ★ HAPPY, HYDRATED PETS make the best traveling companions, and the LumoLeaf Water goes wherever you and your furry friend venture. Reversible leaf-shaped bowl lays flat over bottle when not in use. ★ A HEALTHIER ALTERNATIVE to public water bowls at dog parks, the LumoLeaf Waterer is made of 100% food-safe silicone. Treat your pet to a refreshing drink anytime and anywhere, without worrying about bacterial transmissions. ★ 1-PIECE MOLDED DESIGN makes dispensing water a breeze. Leaf veins structure reinforce LumoLeaf Pet Bottle shape without detracting from its flexible portability. The sleek, slim contours allow water bottles to fit into car cup holders. ★ EASY CARE AND PORTABILITY make the LumoLeaf Pet Water Bottle an essential travel accessory. Includes a removable aluminum buckle so you can attach your water bottle to a backpack or belt loop. The LumoLeaf Pet Bottle and Leaf Bowl are dishwasher-safe. ★ UNIVERSALLY COMPATIBLE with most 30/38 mm water bottle necks, our expandable silicone leaf boasts a leak-proof hermetic seal. When used with our 20-oz bottle, you'll have plenty of water for traveling with your dog or cat. If you have any questions about this product by LumoLeaf, contact us by completing and submitting the form below. If you are looking for a specif part number, please include it with your message.